A gluten-free recommendation from Georgi Page-Smith, who reports on GF products for THE NIBBLE. One of the perks of my gluten-free lifestyle is the license I give myself to eat limitless quantities of cheese. Years ago I indulged my cheese cravings with perhaps the best cheese crackers ever to exist (including Cheez-Its): Gluten Free Cheddar Snackers, by The Grainless Baker. These crackers were unabashedly rich and cheesy, with just the right melt-in-your-mouth crumb. I purchased them in bulk from a local store until they were discontinued by the store; then I stalked them online. One day in 2011 the crackers disappeared completely. I searched, I Googled…and I found the Grainless Baker website. 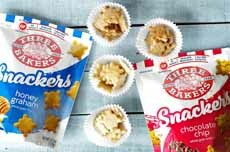 It said that the company had recently joined forces with The Gluten Free Food Group and would be replacing their old products with a new gluten-free product line under a new brand name, Three Bakers. I joined their Facebook community and waited to hear about the rollout. I think I even wrote a sad note “beg-couraging” them to not change their Cheddar Snackers formula. And then I cold-stored the information in a mental box with other sad things and doubled-down on my brie consumption. Recently, however, these crackers drifted into my mind again and I went to check their Facebook page for an update. The page was defunct and a cheerful selection of Snackers were now available from the Three Bakers website! I swung into action and within days, four bags of Snackers—Cheddar, Chocolate Chip, Chocolate Chocolate Chip and Honey Graham flavors—arrived at my doorstep. That was Friday. As of this Sunday’s writing there is about one-quarter of one of the bags left. They were that good. The Cheddar Snackers, though not as intense and decadent an experience as the originals, are incredibly good. The flavor is authentic tangy-and-toasty cheese, and they are quite light, delivering more flavor than you would expect in such a small package. The only downside on these was the texture, which was slightly more brittle than the other Snackers. Use them as dippers, as croutons on salad or chili (photo #1), in a crust for apple pie or pot pie, as a garnish on mac and cheese, or as a snack with apple wedges. The Chocolate Chip Snackers, with only 4 grams of sugar and 90 calories per 1 ounce serving, were simply scrumptious, with a gently dissolving crumb that quickly delivers the flavor to every part of your mouth. Best of all they are not too sweet, with no cloying aftertaste! 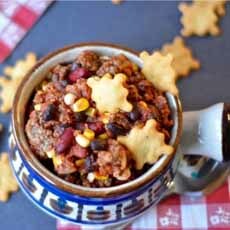 Cheddar snackers add some crunch to chili (photo courtesy Three Bakers). 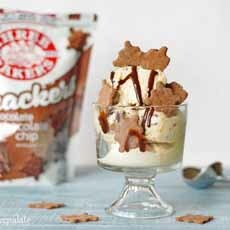 Time for dessert: chocolate chip snackers with ice cream (photo courtesy Gluten Free Palate. Just plain snacking (photo courtesy Gluten Free Palate). The chocolate is of a high enough quality to carry the cookie, without additional sweeteners. The Chocolate Chocolate Chip Snackers increase the chocolate ratio, for aficionados. The Honey Graham Snackers deliver a very tasty, roasty flavor— again, with a gorgeous texture. These would also be fantastic on an ice cream sundae (photo #2), or crushed up to use in a crust. I was also impressed with the low sugar level, at 1 gram per 1 ounce serving, it made it that much easier to eat the whole bag. All Three Bakers’ Snackers are Ccrtified gluten-free by the Gluten Intolerance Group (GIG) and are made with non-GMO ingredients. The whole grains provide a source of fiber and the low sugar and salt mean that you can feel good about serving them to kids. Three Bakers also produces gluten-free breads, buns, pizzas and more. The products are available across the country; here’s a store locator. For more information head to ThreeBakers.com.